So I started this piece with this chaotic under-layer of lines going everywhere in this discontinuous progression of ink swirls. I started shading in some of the line areas and some great shapes started to emerge. 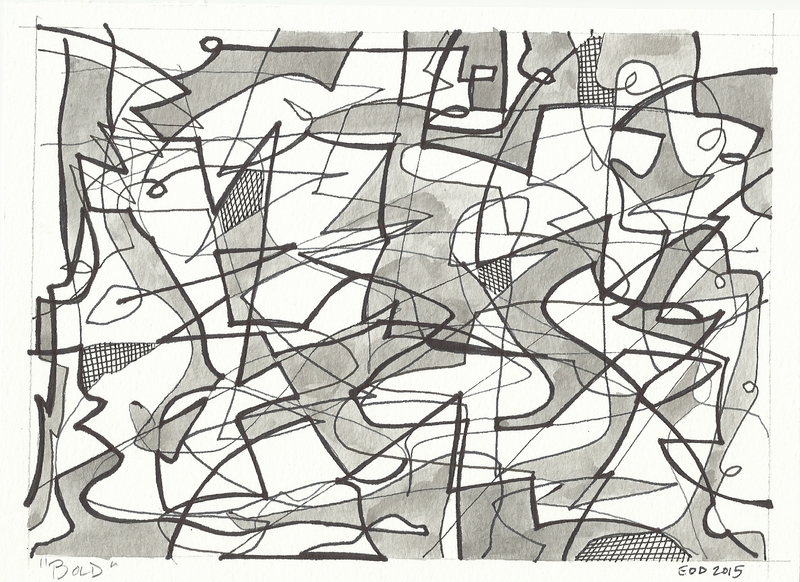 I decided to go mono-chromatic with this piece to draw out the beauty of the emerging lines. I love seeing new work come to life and take shape. I feel like I go into every piece ready to let it just happen without a definitive idea where its going or what kind of result I want to achieve. Really love this one, Eli! I’d love to see a color version, but this monochrome is very nice also. Hi Laura, thank you so much! Color version would be fun to take on. I feel like this piece would work well in an office conference room or some other corporate space. I like this in monochrome. There is only so much that each piece can contain and I think color would send it over the edge. I really like this one. Claudia, great insight on this piece! Thanks so much for your comment. Beautiful. The monochromatic color scheme really allows the composition and design to take center stage. Nicely done. Yes, yes, yes! Great comment and exactly what struck me about this piece too! Thank you very much for your feedback! To me, this one has a mid-century or early sixties feel to it. I like it! Kevin thank you so much I really appreciate the comment and I also appreciate you taking time to look at my work. I enjoyed viewing your work and plan on frequenting your site to see what you’re up to. Thanks! Sounds great I’ll be checking back with you too!